Stanford Cancer Center South Bay offers world-class care in a patient-friendly setting. With the goal of creating the optimal treatment environment, we asked cancer patients to help us design the kind of facility they wanted for themselves. The result: A state-of-the-art medical building, arranged for comfort and efficiency, where we offer coordinated, convenient, patient-centered care in a single location. From diagnosis through treatment, service and support delivery, and lifelong follow-up care; it's all here. We offer diagnostic imaging, infusion therapy, radiation therapy, surgical treatment options and support services. We treat every aspect of you – mind, body and spirit. Stanford Cancer Center South Bay is laid out so you can schedule multiple appointments and treatments in one visit. Our building is easy to navigate, with a single place to check in and centrally located reception desks on every floor. The location is convenient to major highways, with plenty of free parking. The way that it is set up now, the oncologist can make arrangements for a patient to come to one site, have a diagnostic mammogram, an ultrasound, an MRI, and even a biopsy, all in the same day and in the same place. This gets answers much more quickly so we can help put together a plan for your treatment. We provide routine cancer screenings and second opinion consultations in addition to cancer diagnosis and treatment. We welcome patients who self-refer or call on their own. What sets Stanford Cancer Center South Bay apart? Stanford Cancer Center South Bay delivers every possible treatment advantage. We are the only NCI-designated Comprehensive Cancer Center between San Francisco and Los Angeles. Stanford physicians have achieved global recognition as leaders and innovators in the prevention and treatment of cancer, developing many of the newest treatments and technology. This depth and breadth of knowledge and experience shapes every patient's treatment plan. Our Stanford Cancer Center South Bay is equipped with the latest and most advanced technology, including top-of-the-line PET CT, CT, MRI, and Linear Accelerators, all located on the same floor. We have a robust research program with access to more than 300 clinical trials, many of which offer groundbreaking treatments unavailable anywhere else. Our team approach to treatment planning emphasizes a partnership patient-care experience, where you are a key member of your treatment team. 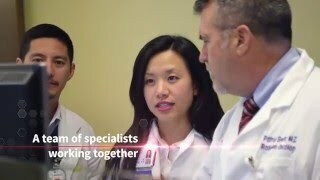 You'll work with multiple specialists, including medical, surgical and radiation oncologists, pathologists, radiologists, geneticists and nutritionists, all collaborating to develop the optimal plan of care for you. We even have specially-designed exam rooms equipped with smart technology to bring specialists and caregivers to meet with you in a timely fashion and with full updates of appointments you've had already and those scheduled to follow. By having the best equipment, we're able to provide patients with the scans that have the highest resolution, the fastest scan times and the lowest radiation dose. And we are very excited to be able to bring those capabilities that we have at Stanford down here to the South Bay.